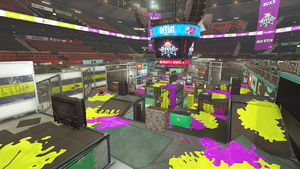 Goby Arena is a multiplayer stage in Splatoon 2. It is designed after a basketball court, with overhead monitors, and the hoops are inkable and play a strategic role in both Regular Battle and Ranked Battle. Goby Arena is a stage featuring many levels, hallways and ramps leading into a central basketball court the functions as the central battleground of the map. The Spawn Point in located at the highest point of the map, inaccessible to the opposing team. The area immediately surrounding spawn provides an alarming amount of inkable turf that in inaccessible to the opposing team, furthermore, the level just below is also inaccessible by the opposing team where the player can either drop off to a small plaza connected to the main court, take an inkrail to the left leading to the raised platforms over the court or take a ramp to the right leading to the outer area. The lower hallways connecting each team's side to the central court contains uninkable ramps making infiltrating the opposing team's base dangerous, a gate that can be swam through is also prescent on the left hallway. The basketball court is a fairly flat open area with two basketball hoops attached to inkable pillars to the left and right which can be used to get to the opposing team's upper area. Two small bumpers on each team's side with a wide bumper at the center of the map. A raised area overseeing the central court is present on each team's side offering a loose vantage point. The Splat Zones is located at the center of the map, the layout of the map in unchanged from Turf Wars. The tower in Goby Arena is located at the center of the basketball court, replacing the bumper that is usually there. The Spawn Point has been pushed forward down one floor to make getting into the center of the map quicker. The most noticeable changes to the map is the removal of the fence on each team's side and the addition of a large inkable block over the uninkable ramp previously there with a grated bridge on top. The goal is located on the lower plaza of the opposing team's side. The first checkpoint is located right below the basketball hoop. The second checkpoint is located on the lip of the upper platform looking over the basketball court. The third checkpoint is located on the newly added platform right before leading into the opponents plaza. The Rainmaker is located at the center of the map where the bumper was previously. The goal is located just below the where each team's Spawn Point is. A number of blocks and barricades have been added around the map. The most noticeable addition are the unlikable ramp being changed to an unikable set of steps making traveling more difficult and a ramp leading up to the goal. The baskets for each team are located fairly close to the center of the map, being just behind each team's fence. An inkable block has been added to the center of the map. Goby Arena was announced on 11 February 2018 at 14:00 UTC and released on 2 March 2018 at 02:00 UTC. The name of the map is a reference to the family Gobiidae, known as goby fish. It may also be a pun on the famous basketball player, Kobe Bryant. While playing on this stage, ambient noises of basketball shoes squeaking on hardwood can be heard. This is especially notable in Recon mode, since there is no background music. Behind team Alpha's spawn, banners can be seen that have the same coloring and logo as the B-ball Jersey (Away). Behind team Bravo's spawn, banners can be seen that have the same coloring and logo as the Lob-Stars Jersey. The internal codename for this stage in the game files is "Court". It is possible to throw a projectile over the walls on the hoops, such as a bomb, and it will explode. Ajifurai Sutajiamu Fried Mackerel Stadium. A parody of Ajinomoto Stadium.